My friend Scott recently sent me a photo which exactly falls into what I call "Chinese Creativity". Scott is originally from The USA, but is living already for over 8 years in Shenzhen where he works as a successful expat for an international enterprise. His luxurious apartment is what I should say beyond the average what you will find in Shenzhen, but nevertheless, he discovered that even on such a location you can have some very creative neighbors. A few days ago was preparing to go to work. 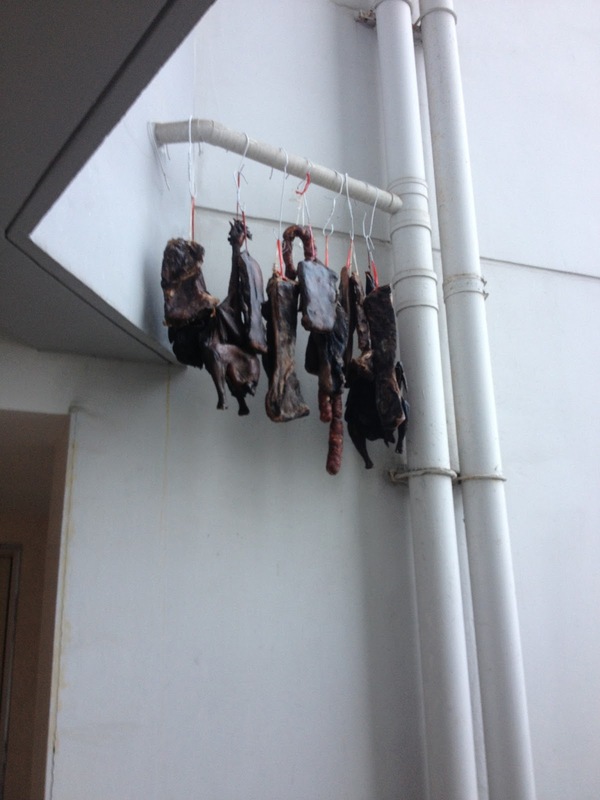 He put on his shoes and opened his apartment door to leave, until he suddenly noticed something weird hanging in the corridor outside his apartment. It turned out that his Chinese neighbors were using the draining pipe to hang their freshly prepared meat out to dry in the sun. 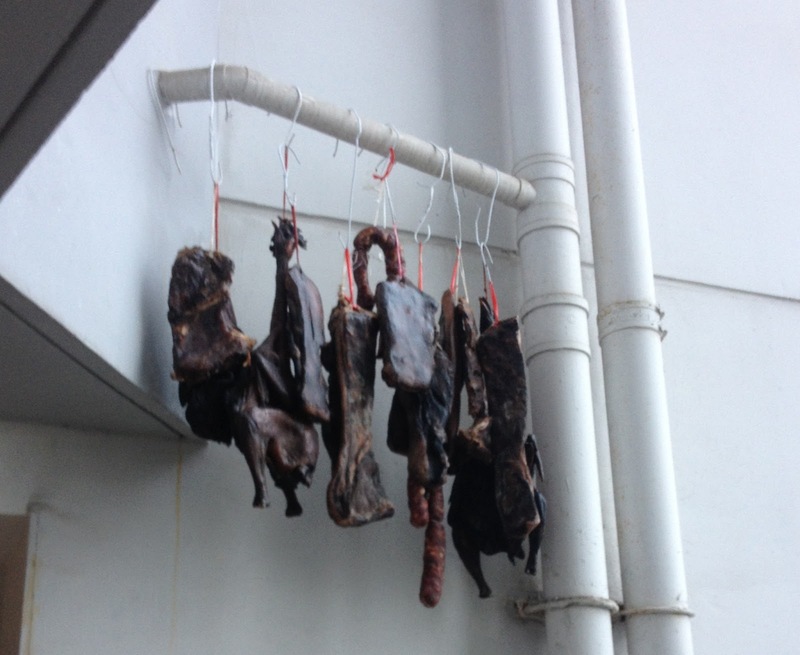 As the Chinese new year is coming, they are probably preparing for a great family feast. Anyway, it would be better if they would choose a better location next time, don't you think so? "Where to spend the Christmas holidays?" is an always returning question by the end of the year. Somehow for the past few years I always had a crazy idea of going somewhere far away where it is cold and uncomfortable. For example, I can remember the extremely cold days in Lithuania where some years ago I ended the last day of the year with lots of new friends at a superb new years eve party, after sightseeing for a few days with -25 degrees outside with my best buddy. Another time I ended up in Kiev, the capital of Ukraine, where it was so "interestingly" cold that the filling of my polyester winter jacket froze so badly that it made cracking noises when I moved my arms. "Mmm, interesting!" To balance the average temperature divided over my total of Christmas trips, I decided to fly to Singapore this time, where it is +30 instead of -30. My family from The Netherlands also flew over to Singapore, so we were able to spend a warm and relaxing Christmas together. After having spent those relaxing days in Singapore, I flew back to Hong Kong with my girlfriend, and after we arrived we only had a few hours to pack for another trip to Taiwan on the next day. While Singapore was to relax and enjoy some family time, the Taiwan trip was to fulfill one of my greatest passions: Cycling. As you probably know, cycling is one of the daily activities for most Dutch people. Children learn cycling from the early age, teenagers take their bicycle to get to school and may other people peddle their way to the office. (My Dutch readers probably recall their daily cycling route now.) Besides using bicycles as a necessary means of transportation, many people take their iron horse out in the weekend to explore the Dutch scenery while sitting on their saddles. All these factors had me convinced that it was pointless to buy a bike in Hong Kong, so during the past 2 years I have cycled only a few times on a rental bike outside the city. So you can imagine I was excited to spend a few days for cycling in Taiwan, where the possibilities for cycling are endless in comparison with Hong Kong. 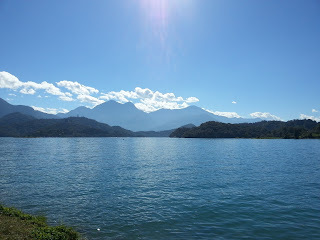 The famous Sun Moon lake near Taichung. We spent a few days in Taichung, where we cycled around the famous Sun Moon lake and a few other locations in the coastal area. The cycling trip was organized by two friends of ours, one from Hong Kong and one from Taiwan. In total 15 friends joined us for this exciting trip. Cycling around the Sun Moon lake is fantastic; the roads are not too busy, and while you are cycling you can enjoy the view of the immense lake and the forests in the mountains. Some of the roads are pretty steep, but overall it was pretty doable. 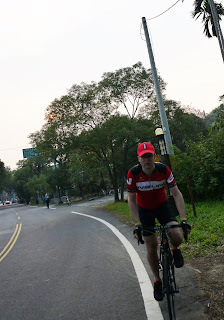 A few days on the bike in Taiwan made me think about my life in Holland, where I used to take the bicycle to go cycling through the tulip fields around my home-town in the evening. While cycling, I often recalled everything that happened during that day; all the issues at work, all the challenges, yes, cycling was definitely a way for me to digest it all. 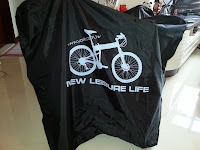 And exactly this refreshing feeling from cycling had been missing in my Hong Kong life so far. That's why on the first day of returning to Hong Kong I made my mind up. "I got to get a bike. Period." Immediately I started looking for a way to be able to have a bike here. "Where to get it? How to store it? Where to cycle? Can you take it in the MTR?" My girlfriend must have thought I had some weird obsession, as the bicycle subject came up almost every 2 hours of the day. And besides that, many people say here that cycling is a "form of suicide" in Hong Kong; The roads are too busy and the drivers either have a blind spot for cyclists, or practice the rule of "who is the toughest driver on the road". Either way, you can imagine it is dangerous to cycle on the roads here. Then secondly there is the lack of space in the small apartments here. Most people do not have the space to store a bicycle, and if you look for any parking space for your iron horse, you will end up disappointed. So either way, I figured out that if I really wanted to have a bike here, I needed to sort of compromise. Cycling in Hong Kong will never be like it was in the good old days in Holland, where I could take any road from my house and cycle until I could touch the sun. Here around my apartment in Hong Kong island there is almost no road where you can have a relaxing ride, and the MTR (Hong Kong Metro) does not really allow bicycles unless you remove the front wheel and walk with it. (which is really impractical as you can understand). I thought of buying a foldable bike, as it may be a solution for the transportation issue and the lack of storage space, but those foldable bikes always have small wheels which make the feeling of cycling not as exciting as it normally is. 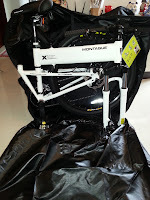 So...foldable bikes were not really an option for me as well. All those issues kept invading my mind over and over again. Did I really get insane? (as my girlfriend was politely suggesting..) "No I am Dutch, and Dutchmen are born to cycle, and so shall it be!" It was my father who had the ultimate answer to my questions. A while ago he had purchased two bicycles to take on his sailboat. 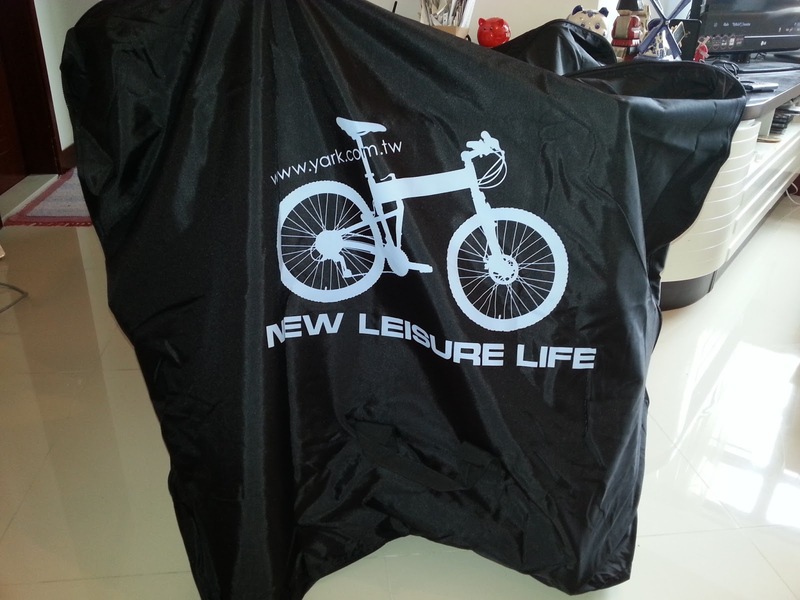 Those bikes are full size, but can be folded into half and stored in a special bag so he can take them on board his boat. When he suggested this idea to me I felt this was the "eureka" moment. 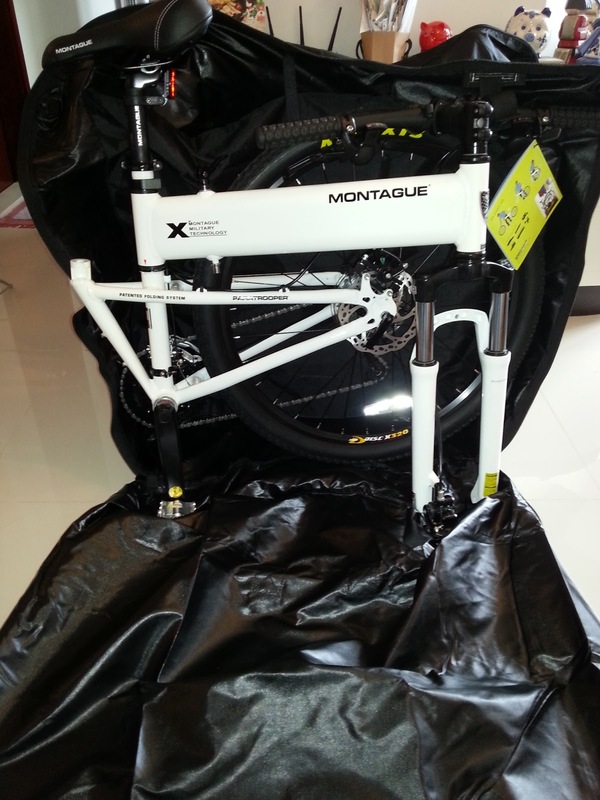 I finally had a solution; I could ride a full size bike with no compromises, and also be able to take it with me in the public transport and store it at my Hong Kong size apartment! 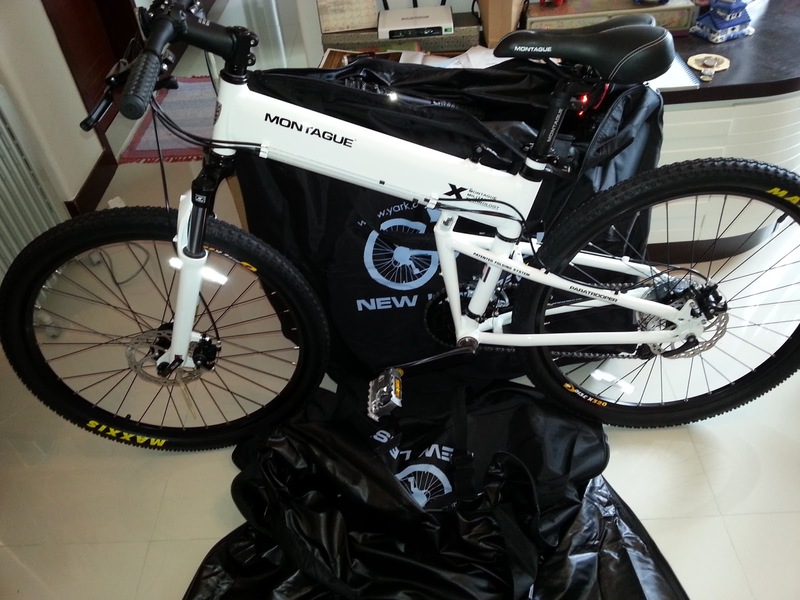 A few days I spent online looking for dealers in Hong Kong, and finally I bought two bikes yesterday at a bike shop in Cheung Sha Wan. Hong Kong people, beware of a new Dutchman on the road! 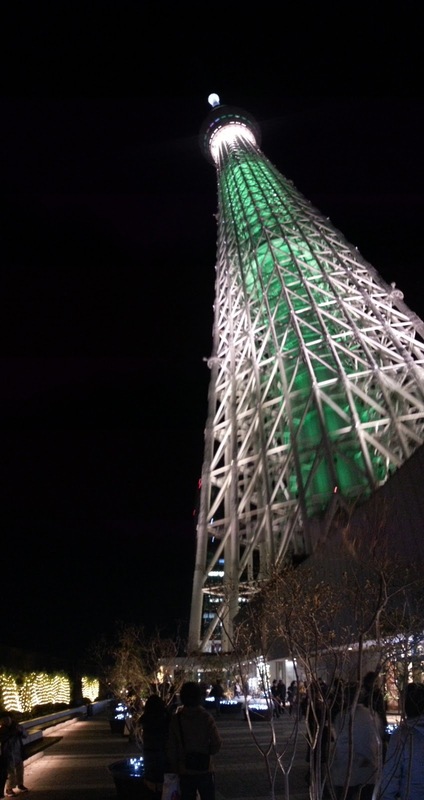 It had been a while since my last visit to Tokyo, and therefore I was excited to get another opportunity to visit this great city again last week. I was invited to manage IT Project there to implement the latest Microsoft Active Directory technology, and besides the interesting project scope, it was a good opportunity to meet my friends and company partners again. Tokyo is another place besides Hong Kong that has attracted my attention. 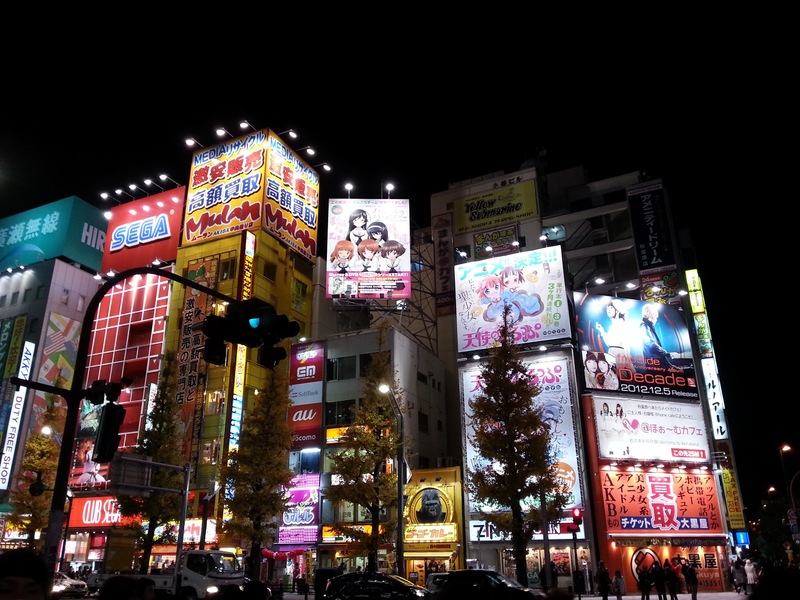 Ever since I first set foot in Japan, I felt that the Japanese way of life is quite different than Hong Kong, but it took me a few years of living in here to really understand what that difference really means. 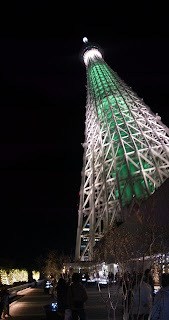 (Perhaps I need to write a separate article about it) Anyway, it was good to be back in Tokyo, and I was enjoying the cold but sunny winter weather which was quite a change from the humidity in Hong Kong. I was staying in a nice hotel in Shinjuku which was located very close to the main train station and (also important) a Starbucks for the daily supply of good coffee. The long working hours and the cold weather made me have several nights of good sleep, however on the 4th night around 5.00am something unusual happened which I couldn't really comprehend at that time. I remember I was in a deep sleep, dreaming something (innocent), until I suddenly felt that my bed was shaking. It started slowly, but the shaking got more intense, and it took me a couple of seconds to wake up and figure out what was going on. "Who is shaking my damn bed in the middle of the night??" I thought. I turned on the light, but nobody was there. Nevertheless the shaking continued more intense with even the walls making a slight screeching sound. "Well I guess this might be an earthquake or some real fatty couple is making love in the room above me", I thought. Then as sudden as it started, the shaking slowed, the walls stopped making noise and my bed became steady again. I lay there for a while with my eyes open, thinking what just happened. People in the next room also woke up as I heard them talking and in the room above me somebody went to toilet. I guess they also must have woken up by this mystery. I lay there a foew more minutes until it got silent in the rooms around me, and as the shaking didn't return I fell asleep again. The morning after I told my Japanese colleagues about the mystery from last night, and they said that I've probably experienced a small earthquake. Nevertheless they didn't seem to have noticed anything last night, and they didn't seem very impressed by my story either. "well we grew up with earthquakes, so when a small one like that happens at night we don't even wake up any more", one said. with 634 meters is Earthquake-proof..
We worked for that whole day on our project in the office, and everything was going quite well until I suddenly felt the same shaking as I felt that night before. It started slowly but quickly grew more intense and I could feel the whole floor underneath me shaking like we were on some bus ride in rural China. I sat down on the office couch, and looked around the room. Everything seemed to be shaking, from the computer monitors, the desks, the closets to even the walls around me. My colleague sat down next to me and said "wow.. this is a big earthquake", and while observing it all I started to think about the ceiling above me which made quite some noise. "How many floor levels there are above our heads?" I asked my colleague, who smiled and said "just one whole apartment". The shaking continued for a little longer, and I think the total time was almost 2 minutes, until it stopped as suddenly as it came. The walls became silent again and the ceiling stopped moving. "Roald I think you just experienced your first real earthquake", one of my colleagues said, and smiled. "I Guess so!" I said... remembering the one from last night, which was nothing compared to this. The radio suddenly stopped playing music and a female news announcer informed us that an earthquake hit the coastal area of Japan with a magnitude of 7.3 and a tsunami warning had been issued. 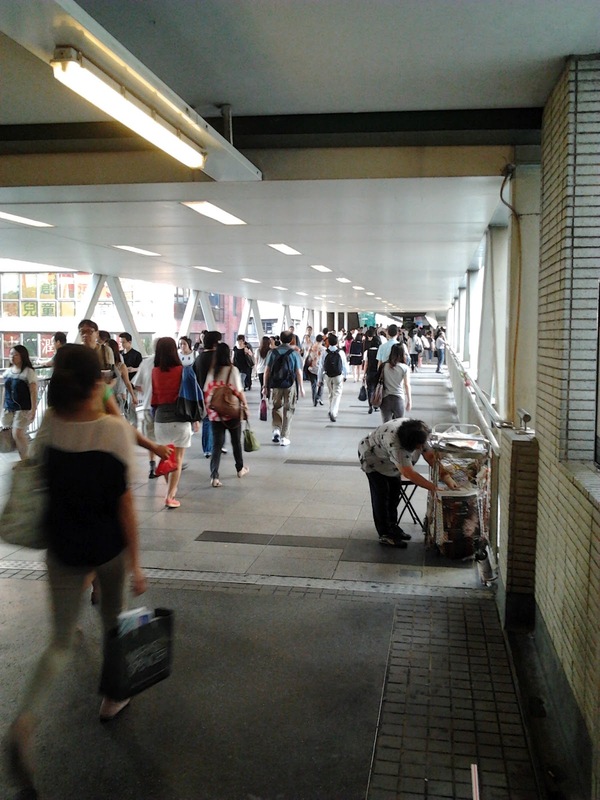 Luckily we are in the middle of Tokyo which is high and dry protected from any Tsunami. And as everything seemed to be back to normal we continued to work on our project. For most Japanese this kind of events are nothing new, as they experience this a lot during their lives. However, for me it was a quite interesting experience as I never sat down on a couch in an apartment where the floor was moving like a roller coaster... I must say it is a quite unusual experience. But... at least I know who shook my bed last night.... Hello Mother Earth! Unfortunatly The Hong Kong busy life is still paying its toll on my available time to contribute to my blog. Nevertheless I'm trying to finish a couple of articles, to be published soon I hope. 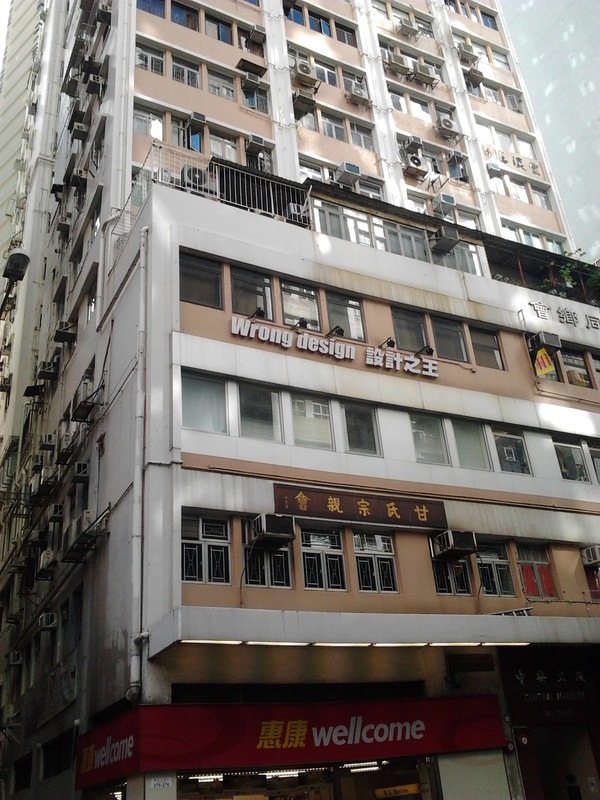 In the mean time I want to share with you some more Chinese Creativity I discovered in Hong Kong. Besides the high-rises, the busy streets, the greasy restaurant smells and the crazy nightlife there are actually many other interesting and funny little details that make Hong Kong so very unique. One of the things I started noticing is the process around "free" newspapers. 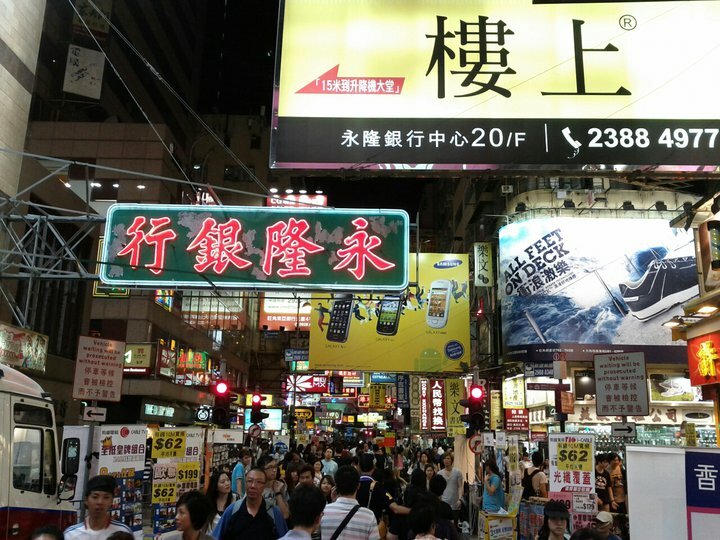 You probably might not have realized it, but Hong Kong has one of the world's largest press industries, and in the digital age that we live in today, the majority of Hong Kong people still reads the news on paper. With 7 million people living on this tiny place on earth you can imagine that the newspaper distribution is big business here. 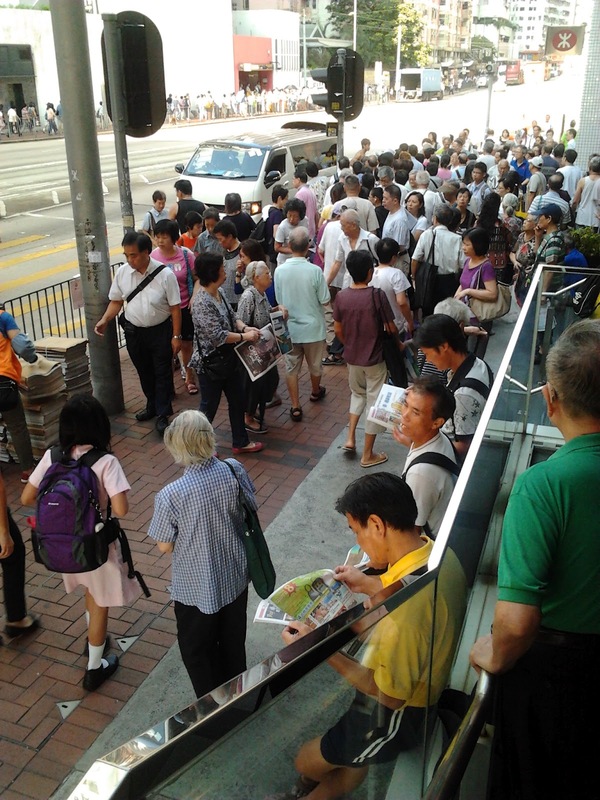 Besides the usual subscription based newspapers, such as Apple Daily (Cantonese) and the South China Morning post (English), there are over 7 free newspapers distributed in Hong Kong. And it is that distribution of free newspapers that I started to find both interesting as funny, as for the last year I found myself wrestling every day through hordes of people waiting in line to get a copy of one of the free newspapers. On my journey to work, which takes only 20 minutes, I pass about 15 of those "distribution points" where the newspapers are handed out to everybody that wants one. Whether it is the AM730, Sharp Daily or another of those free newspapers, the women who hand them out all have their own strategically chosen location, and I noticed that the place they stay never changes, which to me feels like they all have negotiated upon who is allowed to stand in which location. Unfortunately the place they choose to stay is also a place where many people are walking to work, so before you know it you find yourself in a maze of people all zigzagging left and right and bumping into you, as the AM730 is located on your left side ("ah, I need to have that") **BUMP**, followed by the Sky Post on the right ("Ah another free one, let's get it") **BUMP**, the standard on the left ("ah, more!") **BUMP** and 5 more to go. You can imagine that when finally reach my work I do not want to read any free newspaper at all. My colleagues all know by now that they shouldn't leave their newspapers on their desk when I pass by, as those editions will all magically reappear inside the dustbin, shredded in a thousand pieces. But besides above traffic issues there is another phenomenon that is going on with those free newspapers. I noticed that next to the people that actually get those newspapers to read them, there is a significant quantity of people that have another purpose for those free newspapers. Every morning I saw a bunch of old people walking with huge trolleys behind them, all filled with... exactly... free news papers. "What does one person need with so much of the same editions of one daily magazine?" I wondered, and so one day I decided to do some investigation and started following a bunch of oldies rushing through the office-worked traffic in their hunger for free newspapers. Their first stop was the Wanchai MTR station where about 5 different newspapers were distributed. 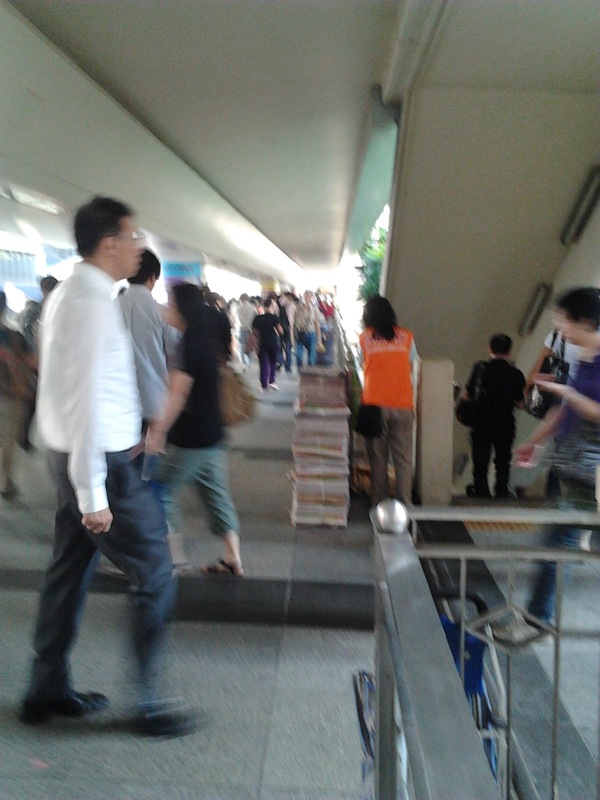 They all quietly walked past each distribution point and got a free newspaper, which then was put on their trolleys. I followed them to their next stop, a few meters further where another 2 newspapers were distributed, which they (again) quietly accepted and put back in their trolleys. Another corner, and 3 of the same papers were collected quietly again and put back on the trolley, and so the process continued for a while until I got bored with following them and went to work. It was only after several weeks later when I found out what really was the purpose of this newspaper-collection-morning-exercise, when on one evening I happened to pass a waste-paper collection point. In Hong Kong the government has set up a waste paper collection scheme where people will get a certain fee for returning waste paper, paid by the kilo. ... huge piles of free newspapers. 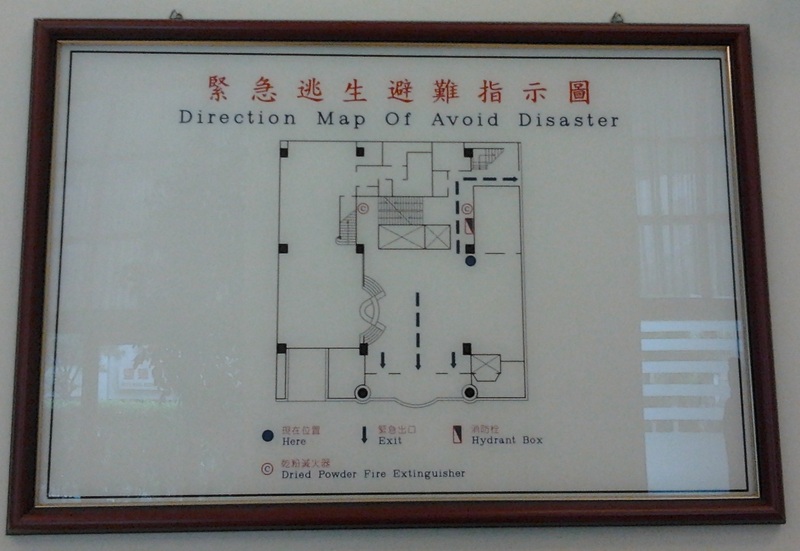 Last week I happened to be in Taiwan for a couple of days, and during my stay I encountered another masterpiece of Chinese Creativity in one of the hotels I stayed. 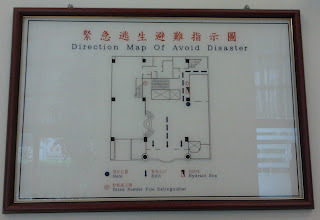 A map to avoid disaster. I would say, too bad I didn't found it earlier, because I could have avoided a lot of previous disasters in my life. I remember my first trip to Hong Kong very well. All the first time sight seeings such as the Peak, Tsim Sha Tsui, Hong Kong park, all were conquered during that first time I set foot on Hong Kong. I was intrigued by the amount of luxury shops where you can buy all the brands like Prada, Gucci, Rolex and LV (that's how they call Louis Vutton here). The shops looked so humongous, luxurious and the most intriguing was that there were huge queues of Chinese citizens waiting to go in and spend their money. Although I consider myself lucky to have earned good money during my professional career, I have never considered to buy any luxury items like expensive watches. The most probable reason for that is both the Dutch mentality ("Doe maar gewoon" we say, which means "Just behave normal") and the fact that my family (although successful) always have kept both feet on the ground. I always feel that it is insane to spend a huge amount of money on something just because it has a different brand name. Ok, the quality may be better as well, but that is not always the case. Of course other people may think differently, but this is my own personal opinion. Nevertheless, after seeing all those luxury items I must admit the luxury-goods-virus also struck me, at least a little bit. "How would it be to wear a Rolex? Would people really act different?" I was thinking. But buying one, no, that is way too expensive. So what do you do when you want to have a Rolex, but do not want to spend the money on it? (Besides stealing...) Right... You buy a fake one. Like me, you probably have had the same spam-mails in your inbox as me, saying "Fake Rolex for sale!". Most of these watches for sale on the internet come in different prices and qualities, but the fact is that most of them are originally manufactured in China. The city Shenzhen (which is close to Hong Kong) is famous of it's fake product markers where you can buy any copy of anything you like, from ferrari clothes, DVD's, to watches and handbags. But Shenzhen was not on my destination list that first time, so I had to figure out how to buy such fake items in Hong Kong itself. When I was talking to my colleague David about this subject, he smiled and told me he might have an idea. David, (who had been in Hong Kong several times before) took a map and showed me a place called "ladies market" in Mong Kok. Someone told him that if you need fake goods, you might be lucky there. Although he knew this "secret" for many years, he never went there before, and after talking some more about the subject, we both felt that it was time to pay a visit to this place. Next evening we took the MTR (Metro) to Mong Kok, and navigated ourselves to the street that supposed to host the "ladies market". When we arrived we saw a long but narrow street where hawkers and small shop owners had set up narrow bamboo-made shops, selling all kind of items. We passed through the first batch of shops and looked around. "Where are those shiny Rolexes?" I thought, but all we saw were cheap souvenirs, t-shirts and other junk. After passing another batch, and another batch of these (very uninteresting) shops, we got a little bit disappointed. "I'm not sure if we're going to find them here" David said. "Maybe they are all gone". "Darn..." I thought. "That would be too bad. Well lets walk a little further, who knows we will find some". But another batch of shops further gave us little more luck than before, and we decided to turn around and go back. Walking through the narrow streets, passing by the cheap goods, the tourists negotiating for 5 Hong Kong dollar discount ( which is 50 cents ladies..), I got more and more disappointed. "We're never going to find those damn Rolexes..." I said to David, and he shrugged.. Immediately at that moment we heard someone say "You looking for Lolex??". I stopped, pulled David to a halt, and looked around who said that. In an alley between the shops was a shabby Chinese guy standing with a smoking cigarette still between his lips. "You want fake watch? I have Lolex"
David and I looked at each other and probably thought the same. "Let's try it" David said and replied: "Yes we are looking for Rolex watches, can we see them?" "Please come, please come" said the Chinese guy, turned around and walked further into the alley without looking back. "I guess we need to follow him" I said to David and off we were. Walking into the alley felt a bit uncomfortable. It was a small and dark street, but luckily there were still people. Then the guy suddenly turned right into an even darker alley, without looking back at us. "I wonder if we are doing the right thing" said David, "but anyway, we came this far, we should give it a try, right?". I nodded, and we turned right, into the dark alley. Nobody was walking here, and as it was evening there was almost no light. Lots of rubbish left and right, cockroaches walking around, and the guy in front of us still walking ahead without looking back. "I hope we're going to survive this" I said to David with a smile. 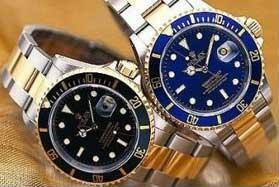 "Don't blame me, we both wanted those Rolexes so bad.." I replied, " but I also hope we'll make it alive". Finally the guy stopped at the entrance of an apartment building. He opened the door, and waited for the elevator to come down. We followed in, and when the elevator came, all 3 of us went inside without saying a word. At floor number 22 (the highest floor) the Chinese guy stepped out and without looking waved his hand as a gesture for us to follow him. Then he turned around, looking us in the eye, and putting his finger on his lips. "ssshh" he whispered, and followed his route with very gentle steps. We passed several apartment doors, some of which the owners had open them to get in some cool air. At the end of the hallway we moved up to the stairs without making a sound, until we came to floor 23. Floor 23 had been installed illegally, and was guarded with a big steel door locked with a chain. The guy reached into his pocket, got the key and opened the lock. After pushing open the gate, he waved at us to go in without saying a word. "Ehrm, is this something we are going to regret?" David was whispering to me. "Do we have a choice for now?" I replied. "I guess not any more" said David, and off we stepped into the unknown behind a prison door. The guy followed in and at the end of the hall there was another door to be unlocked by our "friend". He did so, and we all stepped into the final rooftop room. When he turned on the light, we noticed a small room (probably 20 square meters) , with 4 tables and 4 black suitcases. The chinese guy opened the black suitcases, and inside was a fine red cover holding at least 15 watches per suitcase. "You want watch for your wife?" The Chinese guy said to David, and pointed out a watch from Louis Vutton. It was silver with a slight pink twitch, and on the glass where shiny glitters. "Are those real diamonds?" David asked, while already knowing the answer. The guy smiled and said nothing. "I guess we know enough" said David, "However I don't think we have a choice whether to buy something or not, but this watch looks ok, so I will buy it". After negotiating the price (which was probably still too high, as the guy was very happy at the end), we all went out of the room, and after closing the door and the steel fence, we tiptoed our way one level down, and took the elevator until we finally were outside. "Safe..." we both thought, and smiled.